mmsonline.com March 2017 MMS 73 FEATURE machining challenge. Experienced machinists were part of the conversation about this project from the beginning, and their input directly affected the redesign. The minimum clearance they could manage for five-axis machining around the nozzles dictated how close the nozzles could be to one another within the 3D-printed form. 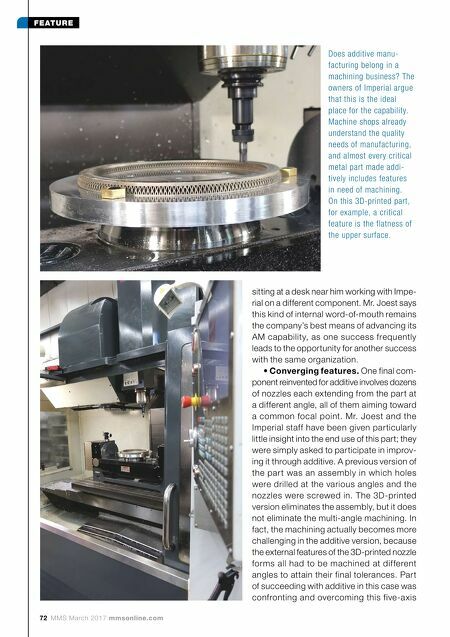 Mr. Joest says this kind of joint participation between additive and machining staff was not an unusual feature of this job, but instead is much closer to what is typical for sophisticated parts made through AM. On the nozzle part, the amount of conversation was unusual (working out this design and process took days), but the conversa- tion itself was not. AM has to be coordinated with other operations for most of the parts it is used to make, which means the needs of other opera- tions have to be considered before the design is final and before 3D printing begins. Recognizing this, Imperial has now integrated additive into a shop-wide process in which additive is no longer something special but instead has a seat at the table that is equal to all of the other contributors to a given job's success. FITTING IN Now, additive manufacturing is a "work center" at Imperial. This is the company's term, which might be understood as "department" or "stake- holder." Vertical milling, horizontal milling, turning, sheet metal, assembly and quality assurance are all work centers here. Before additive ever appeared, team members representing each work center relevant to any par ticular job would all come together to discuss how that job would be carried out. One work center frequently had to provide for the needs of another. Specifically, the needs of either assembly or QA might affect the way a part is machined. 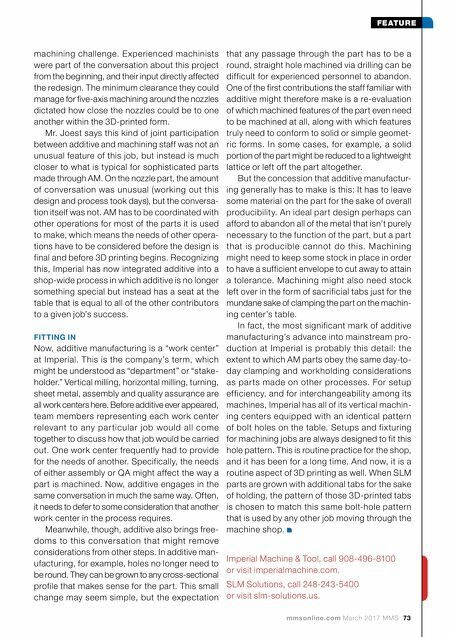 Now, additive engages in the same conversation in much the same way. Often, it needs to defer to some consideration that another work center in the process requires. Meanwhile, though, additive also brings free- doms to this conversation that might remove considerations from other steps. In additive man- ufacturing, for example, holes no longer need to be round. They can be grown to any cross-sectional profile that makes sense for the part. This small change may seem simple, but the expectation that any passage through the part has to be a round, straight hole machined via drilling can be difficult for experienced personnel to abandon. One of the first contributions the staff familiar with additive might therefore make is a re-evaluation of which machined features of the part even need to be machined at all, along with which features truly need to conform to solid or simple geomet- ric forms. In some cases, for example, a solid portion of the part might be reduced to a lightweight lattice or left off the part altogether. But the concession that additive manufactur- ing generally has to make is this: It has to leave some material on the part for the sake of overall producibility. An ideal part design perhaps can afford to abandon all of the metal that isn't purely necessary to the function of the part, but a part that is producible cannot do this. Machining might need to keep some stock in place in order to have a sufficient envelope to cut away to attain a tolerance. Machining might also need stock left over in the form of sacrificial tabs just for the mundane sake of clamping the part on the machin- ing center's table. In fact, the most significant mark of additive manufacturing's advance into mainstream pro- duction at Imperial is probably this detail: the extent to which AM parts obey the same day-to- day clamping and workholding considerations as par ts made on other processes. For setup efficiency, and for interchangeability among its machines, Imperial has all of its vertical machin- ing centers equipped with an identical pattern of bolt holes on the table. Setups and fixturing for machining jobs are always designed to fit this hole pattern. This is routine practice for the shop, and it has been for a long time. And now, it is a routine aspect of 3D printing as well. When SLM parts are grown with additional tabs for the sake of holding, the pattern of those 3D-printed tabs is chosen to match this same bolt-hole pattern that is used by any other job moving through the machine shop. Imperial Machine & Tool, call 908-496-8100 or visit imperialmachine.com. SLM Solutions, call 248-243-5400 or visit slm-solutions.us.